SHADOWLAND TIE-IN! 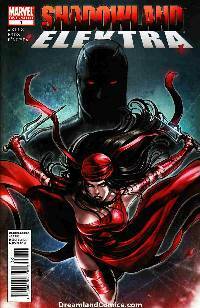 Elektra Natchios had vowed to never again interfere in the life of her ex-lover, Matt Murdock. Learn what made her break her vow and return to Daredevil's side at Shadowland. Zeb Wells (DARK REIGN: ELEKTRA) returns to the character with hot newcomer Emma Rios (AMAZING SPIDER-MAN) for a vital piece of the Shadowland puzzle!